We identify and improve difficulties that interfere with the child’s potential to perform functional daily living skills and peer activities. Direct treatment is provided as well as a consultation for a home program. Our occupational therapists incorporate sensory integration and neurodevelopmental techniques specific to each child’s needs. Occurs when one or more of our sensory systems have difficulties accurately processing environmental stimuli. The result may be subtle or it can be very disruptive for the child and family. A child with sensory processing difficulties may interpret a gentle touch as extremely invasive and react with “fight / fright / flight” reactions. Things that may be interpreted by others as pleasurable may be interpreted as painful to this child. Sensory Integration treatment can help this child to process sensory stimuli more accurately to allow for improved function and quality of life. Extreme over responsiveness to normal sensations such as touch, sound, movement, vision, smell. Extreme under-responsiveness to normal sensations. May constantly seek out a lot of rough and tumble play, chooses to eat very spicy foods, little response to painful situations. May tend to be lethargic or have a low activity level. May be overly active or in constant motion. May exhibit poor sleep/wake cycles. Has difficulties handling changes in routines or transitions. Difficulty calming self-down or staying appropriately alert and focused to complete activities. Decreased body awareness, and/or poor motor planning skills (ie. difficulty getting on/off play equipment or furniture). Excessive need to control his/her environment. The Interactive Metronome (IM) is a therapeutic assessment and training program that improves attention, concentration, motor planning and sequencing. Improvements in those areas result in stronger motor control and coordination, improved motor control and coordination, balance and gait, and improved language and cognition. IM is a structured, goal-oriented program that challenges the client to synchronize a range of whole-body exercises to a precise computer- generated beat. The client attempts to match the rhythmic beat with repetitive motor movements. IM’s game-like features engage the client with auditory and visual guidance and provides real-time feedback while encouraging him/her to improve their scores. The SOS program integrates sensory, motor, oral, behavioral/learning, medical and nutritional factors in order to comprehensively evaluate and manage children with feeding problems. The program is offered in both individual and group formats. SOS is based on normal developmental steps, stages and skills of feeding typically found in children. It uses a systematic desensitization hierarchy of skills necessary for children to progress with eating various textures and a variety of foods. 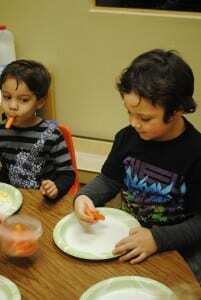 This program has been helpful in assisting many children with a variety of feeding needs and diagnoses, especially children who are picky eaters. Sessions focus on actively exploring and eventually tasting new foods. Parents are required to observe group treatment sessions in order to begin to carry over and use this approach at home. Physical Therapy is available for children who display delays or difficulties with gait and mobility. We are able to address the specific needs unique to children. We evaluate orthotic and equipment needs in addition to gross motor delays associated with various health issues, medical conditions and birth defects. At Children’s Therapy Center, we take pride in our quality of care. Our therapists work closely with children to decrease pain, improve movement and coordination, build strength, overcome balance difficulties, and help them resume daily activities. We also offer personalized exercise regimes that include strength and endurance training as well as gait training. The objective is to improve the quality of a child’s life with exercise and fun activities. Speech Therapy helps in the identification and improvement of your child’s abilities associated with expressive and receptive language, functional communication, and oral motor feeding issues. If your child has trouble pronouncing words or hearing loss, speech therapy could help in language and communication development. Treatment includes family priorities along with therapist recommendations for a complete program. At Children’s Therapy Center, our goal is to work with parents, caregivers, school personnel and other healthcare providers and educate them about the unique needs of children suffering from speech impairment. Initially, we will have the parent and child meet with a Speech therapist so we understand the condition better. Following this, we will prioritize and develop individual therapy programs, helping children reach their fullest potential.